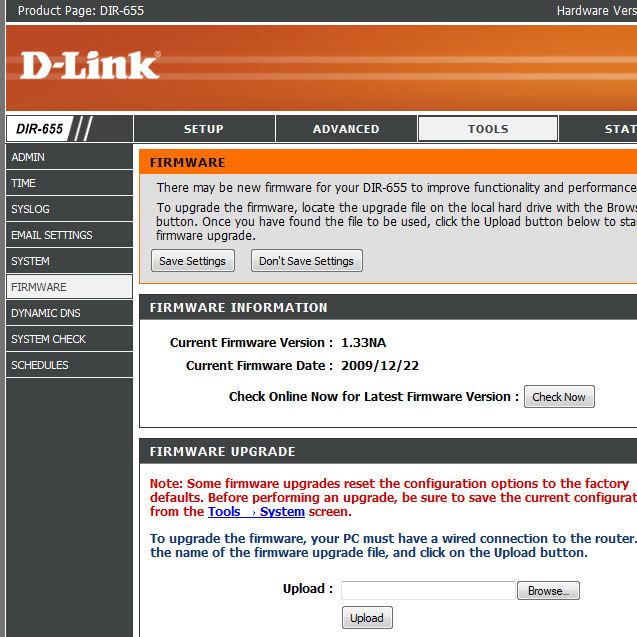 D-link have released an unsupported beta version of the DIR-655’s firmware, this supposedly fixes only the DNS Relay bug. You can get it here, they seem to be pretty insistent that the firmware shouldn’t be used if you’re worried about your warranty etc so I will just leave it at that link, I’ll be testing this seeing as my router is stuck as a glorified Wireless AP and Gigabit switch due to it’s bad behaviour so it can’t really get much worse. I haven’t had a chance to check yet, it seems to be a bit hit and miss for others but I haven’t heard of it bricking any routers so that’s a plus. :S i dont know, i found some problems on my router. Hi guys, Firmware 1.33b01NA has been released. have u try it already ? I have tried 1.33b01, works pretty good, it also is meant to fix the DNS relay bug apparently.